Allen grew up in Morristown, Tennessee and was a star athlete at Morristown High School. He attended the University of Kentucky, where he played football, basketball, track and golf. He was on the varsity football team between 1939 and 1941, playing as a tailback under head coach A. D. Kirwan. The team finished with winning records in each of the seasons Allen played, but was not ranked in the AP Poll of the best college teams in the country. Allen was a triple threat man, handling passing, running and kicking duties for Kentucky. Allen was a member of a Kentucky golf team that lost only one match in 1940 and went undefeated in 1941 and 1942. He played varsity basketball between 1940 and 1942, earning a spot on the Southeastern Conference all-star team in his final year. Allen's college career was interrupted by service in the U.S. Army during World War II. He enlisted in 1942 and spent four years in the Army, rising to the rank of major. Allen returned to the University of Kentucky to finish his education and play a final year of football. A controversy developed, however, over his eligibility to play in 1946 because he had already played three varsity seasons before enlisting. Southeastern Conference commissioner Mike Conner ruled him ineligible in September, shortly after he had been certified to play based on a rule that gave four years of varsity eligibility to men who served in the war. Several days later, he was again ruled eligible by the conference's executive committee. Kentucky head coach Bear Bryant said he was "deligted" with the decision. After quarterbacking Kentucky to victories over the University of Mississippi and University of Cincinnati, the conference reversed its decision and declared him ineligible. He spent the rest of the year coaching backs under Bryant. Allen was drafted by the Chicago Cardinals of the National Football League (NFL) in 1947 but instead joined the Cleveland Browns of the competing All-America Football Conference (AAFC). He competed to be a backup for starting quarterback Otto Graham in the team's T formation offense. Allen struggled to learn Cleveland's formations, which differed significantly from the single-wing formation his Kentucky teams used. Allen had four interceptions in limited playing time for Cleveland as the team finished the season with the 12–1–1 record and beat the New York Yankees in the championship game. Allen returned to the University of Kentucky in 1948 and was named the football team's offensive coordinator under Bryant. Blanton Collier, who had been a backfield coach for the Browns, succeeded Bryant as Kentucky head coach in 1954. Collier kept Allen on his staff but switched him to defensive coordinator. Allen remained an avid golfer as he continued his coaching career, winning the Kentucky Amateur Golf Championship in 1955 and 1958. He came in second place in the tournament in 1956 and tied for first place in a tri-state championship. Allen left Kentucky in 1962 to become a backfield coach for the NFL's Dallas Cowboys under head coach Tom Landry. In 1970, he became a special assistant to Landry and headed the Cowboys' research and development department. In that role, he was responsible for scouting all of the Cowboys' opponents. The Cowboys won Super Bowl VI in 1972 while Allen was with the team. Allen suffered a heart attack before the 1973 season, but remained with the team until 1983. Allen died of cancer in 1988 at the Presbyterian Hospital of Dallas. "He was a tremendous coach, as well as a real bright type of guy who had a statistical mind," Landry said after his death. "He could keep up with anything." Landry also praised his sense of humor. 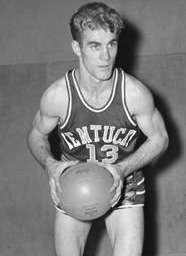 Eugene Meeks, who played college football with Allen, said he was one of Kentucky's best-ever athletes and a dominant golf player during his time at the university. 1 2 3 4 5 6 7 8 9 10 11 12 13 14 15 16 17 18 19 20 Hewlett, Jennifer (February 10, 1988). "Ex-UK Star Ermal Allen Dies". Lexington Herald-Leader. p. C1. Archived from the original on October 7, 2012. Retrieved September 15, 2012. ↑ "Kentucky Yearly Results". College Football Data Warehouse. Archived from the original on October 7, 2012. Retrieved September 15, 2012. ↑ "Ermal Allen Carries Kentucky Hopes For Victory Over Vols". The Miami News. Atlanta, Ga. United Press International. November 20, 1940. p. 2B. Retrieved September 15, 2012. ↑ "Bryant Loses Ermal Allen". The Tuscaloosa News. Associated Press. September 8, 1946. p. 8. Retrieved September 15, 2012. ↑ "Kentucky Star Eligible Again". Kentucky New Era. Lexington, Ky. Associated Press. September 21, 1946. p. 1. Retrieved September 15, 2012. ↑ "Allen Benched By Officials". St. Petersburg Times. Lexington, Ky. United Press International. October 6, 1946. Retrieved September 15, 2012. 1 2 3 Sauerbrei, Harold (August 1, 1947). "Allen Percolates In Opening 'T' Test". Cleveland Plain Dealer. p. 16. ↑ "Ermal Allen". Pro Football Reference. Archived from the original on October 7, 2012. Retrieved September 15, 2012. ↑ "All-Stars Tough". The Victoria Advocate. Dallas. Associated Press. July 25, 1972. p. 2B. Retrieved September 15, 2012. ↑ "Dallas Downs Dolphins 24-3 In Super Bowl VI". Lodi News-Sentinel. New Orleans. United Press International. January 17, 1972. p. 12. Retrieved September 15, 2012. ↑ "Namath to report late as usual". The Southeast Missourian. New York. Associated Press. July 10, 1973. p. 16. Retrieved September 15, 2012.